Maybe it’s all the Back to School stuff that’s back in the stores or maybe it’s the fact that August is just about here. It could possibly even be that it’s because I went with Josh last week to order our homeschool curriculum for the girls. Whatever the reason, I was bitten by a bit of the “fall is almost here” bug and it inspired me! I was thinking about how yummy would it be to make a cake inspired by caramel apples. I love caramel apples, but I never eat them because it hurts my teeth to munch an apple that isn’t cut into slices. 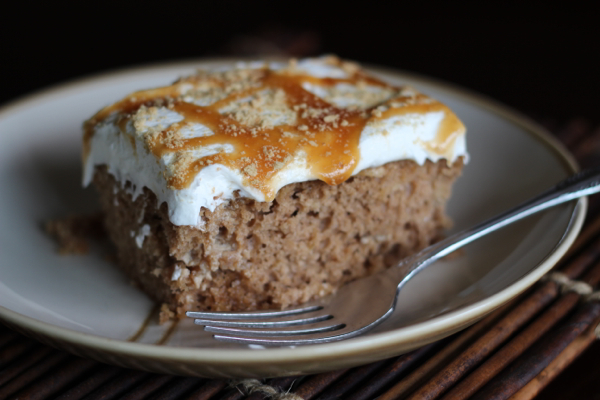 This cake uses a spiced cake mix, grated apples, and caramel sauce sauce that makes sweet little pockets inside the cake! How can you go wrong with a cake like that? I sent Josh to work with this cake last week and by the time I got it back, it was all gone! I think they all like being my guinea pigs when it comes to recipe testing, lol! While it certainly may be a tad early for fall recipes, this will ease the pain of losing the long summer days as we head into the early crisp mornings. Craving a caramel apple? This cake will satisfy that particular craving! In a large bowl, combine cake mix according to boxed directions. Stir in grated apple shreds and pour into a greased 9×13 baking dish. Bake according to boxed directions. When cake is done, cool completely. After cake has cooled, take a straw and poke holes all over the top of the cake. 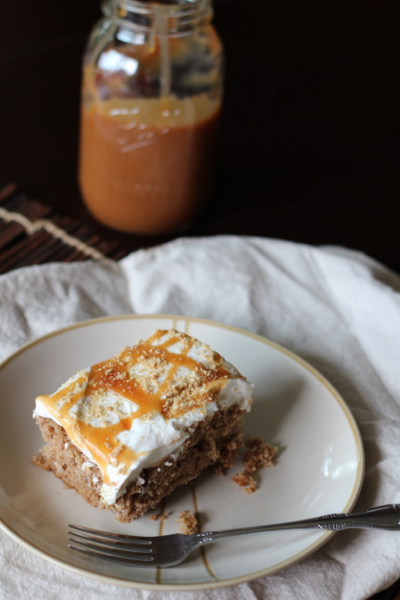 Pour 1 cup of the caramel sauce over the cake, taking special care to pour over the holes in the cake. Spread any excess caramel around. Refrigerate for 3 hours. Frost the top of the cake with Cool Whip. 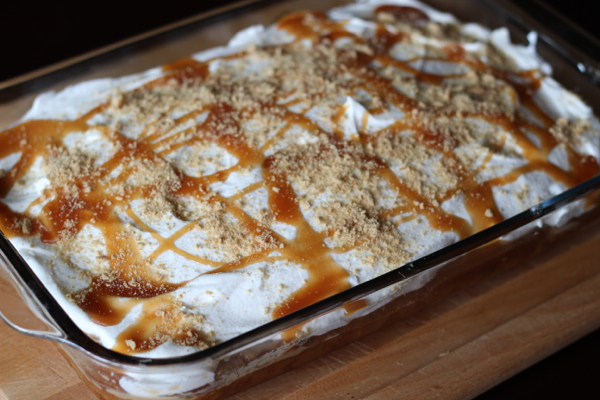 Drizzle the remaining caramel sauce over the whipped topping and sprinkle graham cracker crumbs over the cake.